A bit more than a week ago I wrote about the unstructured shoulder, used in most of the jackets I wear on a day-to-day basis. They work great in a casual setting and in some cases equally well at work, but sometimes the situation calls for something a tad more formal (Additionally, for persons with heavily sloping and weaker shoulders, it is good to have somewhat structured shoulders in all your jackets.). Now, pretty much all of the world's jackets, part of a suit or not, have padded shoulders. Some have more structured shoulders, some have lighter padding, some have strong roping etc. I won't go into tailor-grade details now, but here are four different examples found in my wardrobe, each with a brief description. 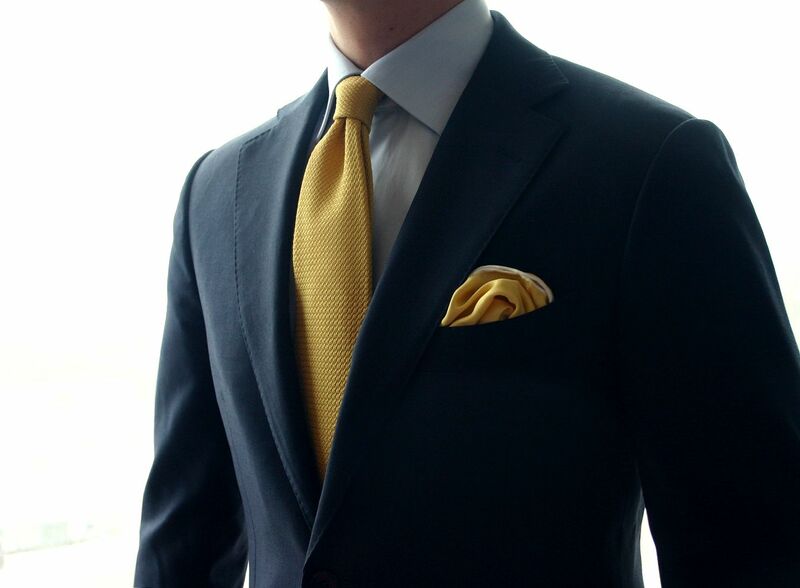 A basic navy wool suit, sky blue poplin shirt, Eve & Ravenscroft yellow grenadine silk tie and a yellow with white contrast border silk pocket square. 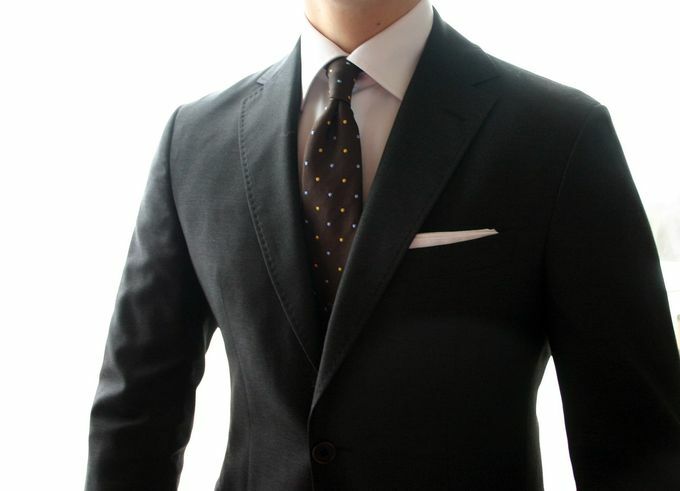 This suit jacket has semi lightweight padding and fairly strong roping (the "ridge" at the shoulder seam). This is about as heavy padding I prefer on my body type and the formality of the piece is further stressed with the roped shoulder. 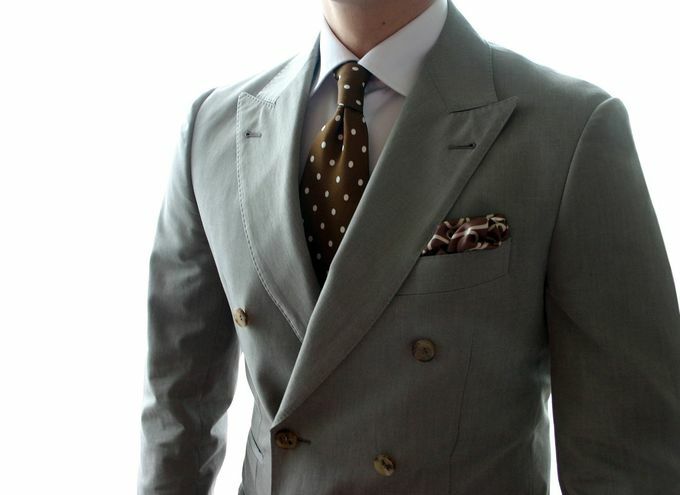 Double breasted cotton suit with a lightly padded shoulder, a white poplin shirt, a Tom Ford polka dot 7-fold silk tie and a Tom Ford geometric print silk pocket square. My favorite tie. Being a casual summer weight cotton suit, this one works well with a very lightweight padding. However, being totally unstructured it wouldn't quite have the flair and edge it has now. Summer weight grey wool suit with a very light and soft shoulder, white poplin shirt, brown pin dot silk tie and a white cotton pocket square. This one is a in extremely softly constructed lightweight (Loro Pianas S150s Tasmanian wool) suit, and has a beautiful soft shoulder line. However, it still has enough padding to give the shoulder line and the torso some "shape". 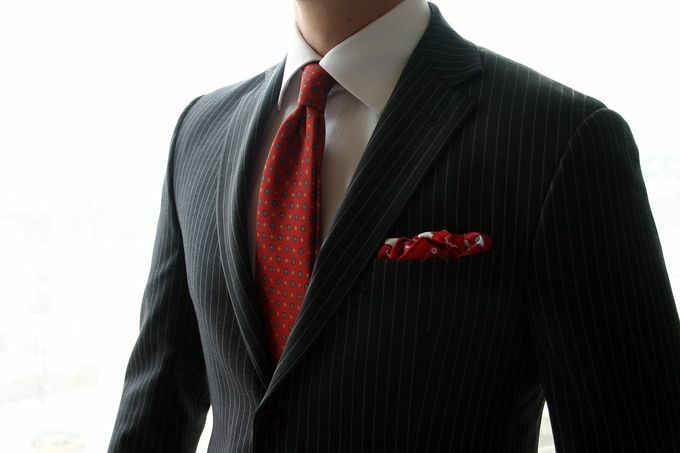 Charcoal grey pinstripe suit from Hickey Freeman, a white poplin shirt, E. Marinella 7-fold silk tie and a red white print silk pocket square. This one is my most constructed suit, still only being about semi heavy. The formal and more commanding shape works well with the charcoal pinstripe fabric, making this a true banker's wardrobe staple. On a later date I might delve into the tailoring side and some features also seen here a bit more, but now this will have to do.